If you are looking for a place off the beatan track for your next holiday , Bhitarkanika could well be your destination, for sea, sand, wildlife and adventure . Pristine isolated beaches, exotic birds, tens of thousands of giant turtles, fearsome crocodiles, narrow creeks that meander past deltaic islands, Wildlife and not a soul around, that is what Bhitrakanika is . Situated at a distance of 130 kms from Bhubaneswar, on the eastern cost of India, Bhitrakanika notified as a sanctuary in 1975 and declared as a National Park in 1998, is spread over 650 sq. kms. With a forest cover of 380 sq. kms ; including the mangrove forest of 115.50 sq. kms. Surrounded and Dhamara and criss crossed by several creeks Bhitarkanika presents a unique environmental and ecological wonder . Few destination in the world have so much to offer at one point . For the admirers of nature, Bhitrakanika remains as a treasure house . Widely acclaimed for its biodiversity, Bhitarkanika stands as one of the few swamps having a compact mangrove eco-system in India, next only to Sundarban in West Bengal . The swamps of Bhitarkanika are of the biggest tracts of estuarine forest in India with more than sixty varieties of mangrove plants . These tracts constitute an environ where tidal circulation of nutrients and salinity varies widely both in vertical and horizontal planes . Change of salinity in water make physiological adjustments by animals and plants species very complex yet essential . The visit of the most endangered species of Olive Ridley sea turtle in lakhs from December to April every year to lay eggs makes the place a favourite center for observation of both the serious scholars and the lay nature lovers . The deltaic region comprises of a couple of tiny island formed by the meandering creeks . With Dangamala ( crocodile center ) at the centre stage ( the others being Ekakula, Habali khati ), Bhitarkanika has remained a natural habitat for a lot of reptiles including Crocodile, King Cobra, Lizards, Pythons, besides wildlife comprising of Wild Pigs, Rhesus, Monkey, Sambars, Spootted Deer and other animals. The pride prossession of the Dangamala fram is Sankhua, the rare White Crocodile . Bagagahana and Saribana are the most enchanting spots from the visitor point of view and a paradise for the ornithologists . Watching over 170 species of residential and migratory birds including king fisher , Open billed storks, Sea eagles , Kites , Sand pipers , Darters, Seagulls, Whistling Teals etc . Can be quite interesting . Similary , watching the wild animals in their natural habitat and listening to the music of the migratory birds while cruising through the creeks can be a thrilling experience . The time to visit Bagaghana and Saribana is 9.30 AM to 4.30 PM. Visitors are required to hire boat from the entry point Dangamala situated only 8 kms away from there . Situated at a distance of 3.3 Kms from Dangamala, Gahiramatha beach of Bhitarkanika harbours the largest known rookerly of Olive Ridly sea turtle in the world . Census made in 2001 reveals that by April nearly 9 lakh ( 9,00,000 ) adult female Ridley turtle came here to Gahiramatha beach to lay eggs . During their stay for over a week , these wonderful creatures throng the beach and they present a breathtaking sight . One can never forget the sight of thousand of Olive Ridley turtle , each weighting 50-60 Kgs, coming out of the sea in the moon light from their chambers to lay eggs. Gahiramatha can be visited from 9.30 am to 6.30 pm by motor boats hired from Dangamala . Atrip to Bhitarkanika is in itself a complete package . However , one can visit some other sites including the 9th c. monument, Siva and Sakti temple at Dangamla . 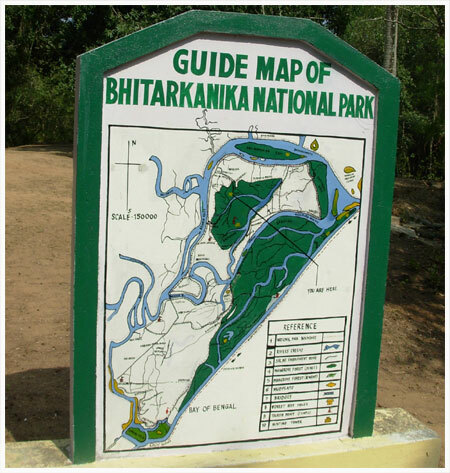 Permission to visit Bhitarkanika can be obtained from Divisonal Forest Officer, Rajnagar, PIN : 754225, Ph : ( 06729 ) 272460 or Assistant Conservator of Forest, Chandbali, Pin . 756133 , Ph : ( 06786 ) 220372 on payment of prescribed fee . Best season to visit – October to June . Regular Bus Seavice are available to Chandbali and Rajnagar . A trip to Bhitarkanika is in itself a complete package . But if you like , You can visit a few more places around it . The unique Beach ata Chandipur where the sea vanishes twice a day ( 16 km from Balasore ) . India Tourism , B-21 ,B.J.B. Nagar ,Pin – 751014,Tel.2432203. Tourist Counter, Railway Station, Tel .223536. KOLKATA : Tourist Office, Utkal Bhawan, 55 – Lenin Sarani ,Kolkata, Pin – 700013,Tel : 033-22443653. CHENNAI : Tourist Office, Tamilnadu Tourism Complex, Near Kalaivanar Arangam, Wallajah Road, Pin – 600002, Telefax : 044 – 25360891. MUMBAI : Tourist Office, Hotel New Bengal , Near Crawford Market , D.N. Road, Pin – 400001,Tel : 022-23401951. This entry was posted on Wednesday, September 14th, 2011 at 12:27 pm	and is filed under General. You can follow any responses to this entry through the RSS 2.0 feed. You can leave a response, or trackback from your own site.